I have a confession to make. Until I became interested in Dan Bern, I’d never actively listened to a song by Bob Dylan. Oh, I knew his name and might even have been able to name a song he wrote, but if I had an opinion of him it would have been – famous singer with the bad voice. As for Bruce Springsteen – I knew who he was and knew a couple of songs he wrote and sang, however I had a grudge against him. It was a completely unfair grudge, but a grudge nonetheless. See, when my husband and I first began dating he led me to believe I’d be going to a Bruce Springsteen concert with him and some of his friends. Then he told me that I wasn’t invited. That there were not enough tickets to go around. I was taken aback that he’d go without me, but he did and had a wonderful time. Not only that, the person who’d either gotten the tickets or promised him the tickets was a girl I was already jealous of. So Bruce was not spoken of around me. Ever. 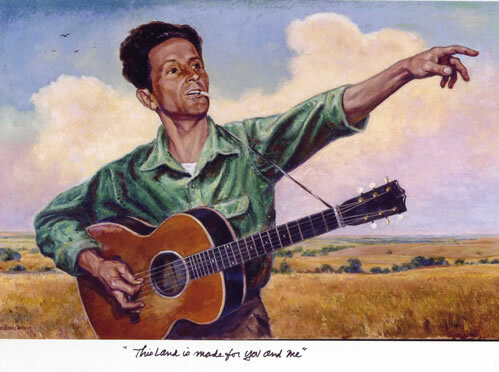 I did know who Woody Guthrie was though – and liked his music. Since discovering Bern, I’ve I’ve listened to music from all of the above, and have done a little reading about them. However, I’ve never found out if the story about Woody Guthrie and Bob Dylan is true. Did Woody, on his deathbed, really tell Bob to go out and be the voice of the new generation? Anyone know? Del? Here’s Dan Bern’s sequel to that tale. She said honey, what am I hearing? Bad associations can really hurt an artist’s chances with a person. I have a little of one I can’t even say aloud in this blog. 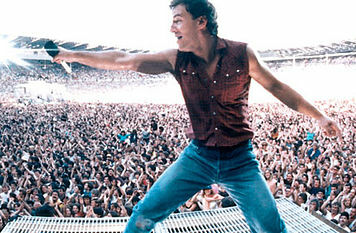 I’m getting over it.On another note, I am probably one of the few Americans who never got the Springsteen bug. I don’t dislike him; I just never got drawn in. It almost feels unpatriotic to admit that.